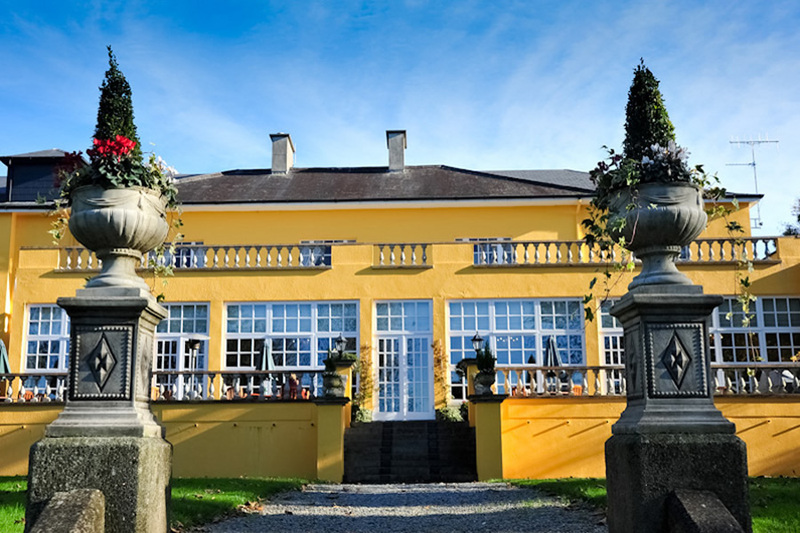 A boutique hotel set amidst 10 acres of parkland on the banks of the River Suir, overlooking Waterford City, Ireland. Offering an elegant lifestyle, with modern chic dÃ©cor, the hotel provides the ultimate in comfort and luxury. The Hotel is on Christendom overlooking Waterford City. Waterford enjoys a popular theatrical scene and has some cultural festivals throughout the year, including Waterford Light Opera Festival. Leisure pursuits include golf, horse racing, greyhound racing, horse riding and fishing, and visiting seaside resorts such as Tramore and Dunmore East. Other sightseeing opportunities include Lismore Heritage Centre, Cappoquin House and Gardens. Visited Easter weekend. Staff on reception very helpful and friendly. It was our anniversary and we received a nice display of fruit and chocolates in the bedroom. Restaurant very pleasant and enjoyed the 'Rat Pack' background music! Food exceptional - beautiful and well presented, and staff serving very helpful. Bedroom + bathroom nice and large. Would return have given 5* but let down by worn towels, frayed edging on bedspread and marks on furniture and bottom of bath. Would be happy to return when next in Waterford. This hotel was a wonderful gem of a find. The staff were most welcoming and the hospitality shown was second to none. The room was spacious, warm, cosy and had nice chocolates and fruit left for me for my birthday which was a lovely touch. The meal we had was excellent, I couldn't fault it. The hotel doesn't have a pool or spa, but being a little outside the city it provides welcome tranquil peaceful surroundings to relax away from the bustle of town. I would highly recommend this hotel for someone looking for a peaceful relaxing break and to be well looked after with delicious food at breakfast and dinner. It was charming and I thoroughly enjoyed my stay. Very restful. Great restaurant and friendly staff. Beautiful location just outside of Waterford. We had a lovely night and the whole experience was great,the food was fantastic with a beautiful breakfast would stay again.Staff very helpful and friendly. Excellent staff. Beautiful hotel. Food in restaurant was amazing but there was no music & it was really too quiet. Also, its a bit of a walk to the town centre. Food at this hotel is good also the rooms are very clean, the only downside is the restaurant is a little quiet and could do with a little back round music so you don't have to whisper when having a conversation. I recently spent three nights there with my teenage daughter and some friends. We enjoyed a wonderful time. The hotel is quite charming, extremely clean and rooms are spacious. The staff were lovely, in particular the receptionist we checked in and out with and the lady who was on breakfast duty while we were there couldn't do enough for us. Our friends had a two year old with them and she had the table ready waiting for us, complete with high chair when went to breakfast. The restaurant was lovely, overlooking the river suir we helped ourselves to fruit and or pastries while waiting for our cooked brekkie. On the last evening we ate dinner in the restaurant (Zak's), it was fab, and I then understood why on Sunday lunchtime when we arrived it was impossible to get a parking spot! Overall I could not fault this hotel in any category. I loved Waterford, the people we encountered both in the hotel and during our trips to the city were warm and welcoming. We will be back! Hotel beautiful. Lovely setting. Quiet and relaxing. Food excellent and staff very friendly and helpful. Room very nice. Would highly recommend. I even received a phone call to say I had left a necklace in the room, which they kindly posted to me. Excellent service. Will be back. Very disappointing overall experience. room very cold and staff only looked after our request for the heating to be looked at after our second time to ask. room was not at all cosy because of heating issues. Bathroom radiator didnt work properly either so condensation was also a problem. This is definitely NOT a four star hotel by any standards. Disappointed with this hotel. It really shouldn't rate itself as four stars. Room was freezing with the heating switched off when we arrived and it didnt heat up to any sortof a comforttable level. The bext day and Only after asking To have the heating looked at twice, was a small blow heater dropped into us. The bathroom was shabby in places and had cobwebs. The ventilation system didnt work properly and we couldn't open the bathroom window as it was really cold outside and the radiator in this room didnt work properly either. (Room 103). The staff were pleasant enought and the meal we had in Zaks Restaurant was good. Breakfast was ok but a bit hit and miss for other guests. The reception area was nicely decorated as was the dining room. The overall experience would not encourage me to return nor would I recommend this hotel. we upgraded to the deluxe suite, it was really quiet and peaceful, service and breakfast was really first class. Will be back. We stayed here for a two night break with dinner on our anniversary this week and we loved it. Beautiful grounds, quiet location but close to the city. The staff at check in and in the restaurant/ bar were very welcoming . The food was really good. The ingredients were locally sourced and very fresh. The coffee was superb (don't ever change your coffee!). The only downside to this hotel was the very old and uncomfortable matresses. However, the lady at checkout told us that they are being replaced very soon. When they are then we will return! The hotel itself maybe not be a four star but the food and service is certainly worthy of it. Rooms are a bit basic and it could do with a touch up but the breakfast and dinner were excellent. Great service as well from the moment we arrived. We'd go again. Just back from an amazing stay at the Athenaeum house. If you want a relaxing getaway for a night or two this is a must. Rooms are lovely just as in picture, brilliant views over Waterford at night time and food is restaurant is gorgeous. Will definitely be back. we had a really great weekend at this hotel everything about it was excellent food was beautiful could nt fault anything about it. perfect for a quiet weekend get away..The hotel food was very nice and the staff were very personable and friendly. Hotel was in a nice quiet residential area. Room was a bit dark and sink tap was wonky. The staff are just lovely. Food is very tasty - both for breakfast and dinner. Friendly, helpful staff, nice food with good chioce. Quiet location, not much within walking distance. Not many facilities in the hotel but idea for certain purposes & maybe older age groups. Does what it can, well. But not for everyone so be clear on what your getting. We stayed in the Athenaeum hotel from 3rd until 5th August. We felt welcome from the moment we arrived. Staff were pleasant and helpful. Room was bright and well proportioned and clean. We dined in the hotel on Wed night. Food was excellent as was the service. It was value for money throughout and we would recommend it highly. Waterford is a beautiful city and the walking tour is both entertaining and educational. Stayed in the hotel over the June long weekend with my girlfirend. It was one of the best hotel stays we have had for a number of years. The hotel itsself is just out side the town, so is very quite at night. But is only 5 mins in a taxi ride into the town. The hotel itself, is of a very high standard inside, not the best rooms but they are nice. The meals in the hotel are of a high standard. But the service in the hotel is second to none, the staff are extremely helpful. And the hotel owner was also around alot and was also very customer focused. I would high recommended this hotel and town for a weekend break. At these prices I can think of nothing bad to say about this hotel perfect base for sightseeing around Waterford on a budget.